Pi is the ratio of circumference to diameter of a circle. Celebrate it on Saturday, March 14! In honor of Pi Day, March 14 (because it's 3/14, like 3.14), I came up with the basis for this song, inspired by Don McClean’s 1971 song “American Pie,” when I was in high school. Feel free sing along with that tune. 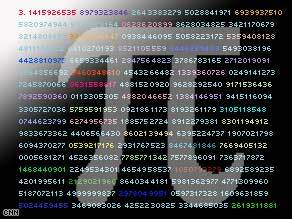 A long, long time ago, it was one December when I thought I'd found the end of pi. That math fair judge, and that's no lie. But tests and papers made me shiver with every paper they'd deliver. Just needed that time to study. And then, my calculator died. 'Cause my calculator seems to have died. My calculator seems to have died. Without a ruler helping you? Of a polynomial of order 2? The screen began to blur - I couldn't even find my curve! The day my calculator died. Searching for the holy grail. I could approximate, but then I’d fail! It just wouldn’t run on new AAAs. And I was still out of power. And it can be so much fun. In my heart I knew it couldn’t compete. The other kids had proof. I felt like such a goof! Like I had just gotten a pie in the face. At least he didn’t turn away. To make me feel worse on Pi Day. He said, “I can’t believe you were so dumb. And tell me there’s another set of batteries besides the quartet. I think I’ll eat some pie. But my calculator didn’t really die! –p.s. Tell us how you're celebrating Pi Day this year. It's also the birthday of Albert Einstein! And, check out the Science Channel's salute to pi for more information about one of the most important mathematical constants. Two drops of whale tranquilizer is enough to kill a person. But last week, scientists used rifle-like guns and foot-long needles to shoot two cups’ worth of the stuff into an endangered whale off the coast of Georgia. Scientists on Friday use poles and knives to try to untangle a whale off the coast of Georgia from fishing line. And, for the first time, it worked. Never before Friday had a wild whale been successfully tranquilized and freed from an entanglement that threatened its life, researchers told CNN. (See video of the dangerous encounter.) The whale - a rare, school-bus-sized whale named Bridle - was freed from hundreds of feet of fishing line that threatened the whale's life, scientists said. That’s big news in the whale world, said Jamison Smith, large whale disentanglement coordinator for the National Oceanic and Atmospheric Administration. It means that researchers have a new tool to help whales in dangerous circumstances. Previously, when scientists tried to sedate whales, nothing noticeable happened. The scientists cautiously upped the dosage until they were successful. The fear of using too much tranquilizer on a whale is great, because it could cause a whale to stop swimming and drown, he said. Bridle is a North Atlantic right whale, which is one of the most endangered large whales on earth. Only about 400 of the school-bus-sized creatures remain, and scientists are worried by the fact that they’ve seen more of the rare whales entangled in fishing lines and gear this year than ever before. Some of the right whales are giving birth through the end of the month off the Atlantic coasts of Georgia and Florida. Record numbers of whales are being born - which is a great thing, since scientists say each one gives the species a slightly better chance for survival. 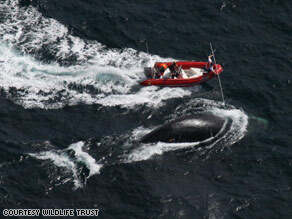 But five whales have been found entangled in fishing line in the last six weeks, Smith said. He called that news "alarming," and said it's unclear what's causing the increase. The lines wrap around their bodies and cause cuts and infections that often prove fatal. Friday was the fifth time scientists had tried to free Bridle. In other attempts, he didn’t respond to sedation and dove deep into the ocean and turned sharply to avoid tiny boats filled with rescuers, Jackson said. Smith said the whale’s injuries are extensive. So, despite the fact that the whale was freed from hundreds of feet of rope, his chances for survival are still uncertain. Jackson said Bridle’s recovery partly will depend on the whale’s will to survive. - And flip through a catalog of right whale sightings to learn more about their stories. Rod Beckstrom, head of the NCSC, resigned last week. There's a bureaucratic wrestling match going on over which piece of the federal government will get to handle cybersecurity. Here's the gist, gleaned from Wired and Forbes' coverage: On one side of the ring, there's the National Security Agency, which is known for its extreme secrecy and its program to wiretap phone conversations of Americans. On the other, there's the Department of Homeland Security, which now manages computer security. The head of the department's computer security branch resigned last week, complaining that the NSA is trying to steal control of the program. 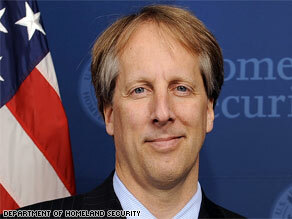 In his resignation letter to the Department of Homeland Security and in an interview with Forbes on Monday, Rod Beckstrom said consolidating the cybersecurity program under the NSA would put too much power in one agency's hands. Privacy groups are concerned about the NSA taking over the program because of how it handled secret wiretaps of phone conversations. But the idea does have support. Director of National Intelligence Admiral Dennis Blair told Congress that the NSA should be in charge rather than Homeland Security. Cybersecurity is a huge issue - especially since technology is often outpacing our ability to understand all of the implications. Many people want to see a solution that improves security without chilling innovation and openness on the Internet - or infringing on privacy. Others see most any attempt at increased security to be needed. This post is just a primer, so please weigh in on this issue in the comments. How far should government go to make our computers secure? And which agency should handle that? Also, check out these cybersecurity tips from Homeland Security. 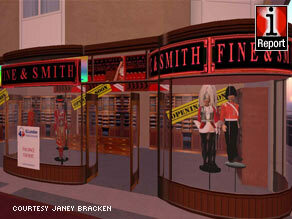 While many retailers in the real world suffer, some still are still opening in Second Life. We know the economy is not doing so well in the real world, but what about virtual worlds? More specifically, Second Life, which has its own economy and system of money. iReporters in Second Life have been sharing stories of how the real world economy is having an effect on the economy there - and the outlook is mixed. “I am quite amazed that lots of businesses in Second Life still push for higher prices when so many people in the real world are losing their jobs," Second Life avatar Janey Bracken said. iReporter Wil Perian interviewed other Second Life residents on the changes they were seeing. “As the real life economy is a bit more unstable, Second Life will be a bit more stable," said Czari Zenovka, a business owner in Second Life. "One dollar goes a lot farther in Second Life than real life." Read more about this on iReport.com. According to Linden Labs, the owners of Second Life, the number of total unique users with “positive monthly Linden flow” has actually increased in the past six months, though it did drop from September to November. Check out more iReport news at the iReport Blog. 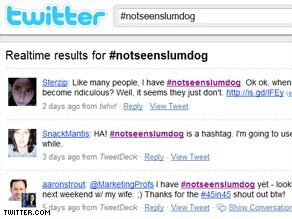 A slew of new hashtags are popping up on Twitter, including #notseenslumdog, shown here. Looks confusing, huh? Thank goodness Amy Gahran of contentious.com has explained this phenomenon for us in a simple way. I'm going to follow her lead and do my best here. That blip at the end of my example - "#job" - is called a hashtag, and it's one of the best ways yet to categorize posts on Twitter. So, if you were looking for a job, or wanted news about jobs, you could search for the "#job" hashtag and come up with what people all over the world are saying on the topic. Another cool example is #sxsw, which marks posts about the upcoming South by Southwest film and music festival in Austin, Texas. If you check out that thread now, people are talking about the difficulties of booking hotel rooms and what their plans are for the shows. This could be helpful for an out-of-towner who wants to get a local feel for what's going on. As Gahran notes, hashtags are a way to make your posts visible to people who don't already follow your updates on the site. In the event of breaking news, journalists also use them to get a feel for what's happening. The catch is that hashtags are often cryptic — usually because they work best when they’re as brief as possible. So you might stumble across an interesting-sounding tweet containing a hashtag like #wci, #plurk, or #tpb and wonder about its context. Although you can follow a hashtag easily with tools like Twitter Search, Hashtags.org, Tweetdeck, or Twitterfall (which Paul Bradshaw recommended yesterday in Tidbits), those tools don’t easily tell you what a given hashtag means. Enter a new world of search sites and dictionaries to make sense of the categories. A few of those Gahran recommends are WTHashtag, Hashtag Reference and Tagal.us. Explained in less than 140 characters: What’s #irritating about #this sentence? It kind of looks like a representation of someone with food in their mouth while they talk. Have fun hashing all that out. Feel free to ask questions in the comments. I'm sure it's quite liberating for the hamster, but I wouldn't count on your floors getting too clean. They say idle hands are the devil's tools. But this Lent, it may be texting thumbs doing the dirty work. Apple has since made iPhone applications the centerpiece of its marketing campaign for the device, with pitches tailored to consumers and business users showing off the breadth and depth of iPhone applications. The rest of the industry has noticed; virtually every other major smartphone company is scrambling to set up their own App Store-like experience. 4. Hope for the bionic eye: The BBC writes that another man has been fitted with a bionic eye and can now see "flashes of light" after surgery at a London hospital. The eyes are designed to help people with a degenerative eye disease. The eye "uses a camera and video processor mounted on sunglasses to send captured images wirelessly to a tiny receiver on the outside of the eye," the station writes on its Web site. 5. Facebook copies Twitter? The New York Times and others wrote about changes unveiled by Facebook, the popular social media site, that some say make it function more like Twitter, another popular site. Facebook is replacing the "status update" box at the top of its pages with a "What's on your mind" box. Twitter prompts its users to enter posts with a similar and perhaps simpler question: "What are you doing?" Square Root Day celebrates perfect squares like these. How many more can you name? For years I have been celebrating March 14 (3/14) as Pi Day, which I have always considered the mathematical holiday of the highest importance - I mean, come on, it's Albert Einstein's birthday! - and never thought about commemorating any other day for its numerical beauty. But today, I have been out-geeked. Today, it turns out, is Square Root Day. That's because it's 3/3/09, and 3 x 3 = 9, meaning 3-squared equals 9. I had never considered that this relationship between month, day, and year occurs so rarely. In fact, this "square root" coincidence in dates only happens nine times every century - the last one being 2/2/04. How should you celebrate Square Root Day? According to CNET, a teacher in Redwood City, California, has organized a contest. Apparently, people will cut root vegetables into squares or make foods into the square root symbol shape. In addition, perhaps you can listen to the song by Huey Lewis and the News, "Hip to be Square." 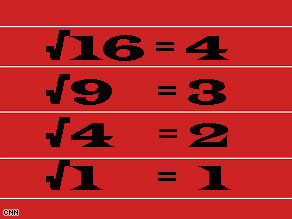 For more on Square Root Day and other math holidays, check out the Cybrary Man Web site. And, stay tuned for my Pi Day tips next weekend. 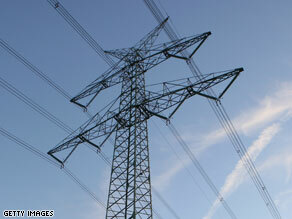 Does the smart grid make you feel dumb? The latest buzzword on the energy forefront is “smart grid.” You may have seen the GE commercial featuring a re-worked scarecrow from the “Wizard of Oz” touting smart-grid products that promise to save you money, help keep the world green and make pink bunnies grow like wildflowers in your yard (well maybe not – but they do promise a lot). There was a House subcommittee hearing this week on this very subject. And an article today on CNN.com. So what does it all mean? The technology GE is promoting is basically two-way communication between your electronic appliances, the outlets and the power company. This will allow you and them better control over how and when you use electricity. And in theory, the more control you have, the more efficient you can be. All of that is very cool, but it’s a long way away. For one thing, our current power grid (the one that actually brings electricity to you from the power plant) isn’t really set up to transmit energy from alternative sources such as rural solar or wind farms to far-away population centers. Our current system is built around centralized power plants delivering energy to nearby areas. What we need to take full advantage of wind and solar power is a whole new grid - a decentralized one that can move power easily from one place to another. That won’t come quickly, easily or cheaply. It’s one of the more expensive parts of T. Boone Pickens’ plan, and many say it will take trillions of dollars and at least a decade to finish. Oh yeah, and our national grid is actually made up of several grids loosely tied together and owned by privately held consortiums - so it will take an act of Congress to get this done. So what next? It seems our country is a bit adverse to paying for infrastructure; we know we need it, but it’s not a new and shiny gizmo waiting in our living room for us to play with. For real progress to take place, we need to realize how important these improvements will be to our future. As always, I can’t wait to hear your thoughts on this matter.